neon genesis evangelion fangirls and boys the world over must be freaking the hell out. The dream is real. you can now be a pilot of your very own diesel fueled Mech Robot, equipped with weapons and everything. 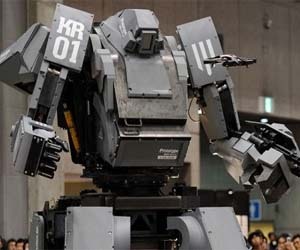 Standing at 13 feet tall, weighing 4.4 tons and known as the Kuratas, this giant MechWarrior actually has a cockpit for you to ride inside, and looks like a truly promising addition the SkyNet program. you can buy this amazing bit of machinery HERE …but you’re gonna need about 1.5 million dollars. IF ANY SUPER FAMOUS CELEB BROWSES THIS WEBSITE BY CHANCE AND BUYS ONE OF THESE BADBOYS EMAIL ME AND LET ME HAVE A GO! !